Galing naman! I never had penfriends from abroad before. Plan a trip to Korea na. :) Hehe. Kung malalim lang ang banga ng kayamanan ko, gorabells!!!! Btw, you mentioned before you have a friend who can read Hangeul. I think she checked my post on Cafe Noriter and translated some wall messages. I hope she can help me translate. I used Google Translator and Bing, kaya lang very poor ang translation. That's so great! As in. I feel your triumph. She must be as elated as you are. Now if only makarating na yung letter mo for me, ako na nasa Pilipinas lang. I'm looking at you, Philpost! Siguro nga! Hindi ko naman ma-okray si Mr Mailman, because Cath Kidston. LOL! Oh what joy to reconnect with your friend, and that would be fun to travel to see her. She even kept your letters too, you sound like soul mates as friends. Ang galing! I had a penpal too. Hmmm.. We exchanged a few letters lang and then nada. Anyareh na nga kaya sa kanya? Hihihi! I am glad to hear that you find your Korean friend. I translate it. After having returned from the Philippines, I found a pen pal in the Philippines while filing a lot of old correspondence. It was 17 years ago, so 1998. I used to take pictures along too long ago. 몇일지나 오늘 우편물이 왔는데 내 추억 속 그 여학생!!!!! After several days, I get a mail from the schoolgirl in my memory today. While Diane unpacked, she also found my letter , and how are you doing fine? she asked me, and I am glad and amazed that she likes Korean dramas. She send her mail address with the mail, and I quickly reply. But English is no different between 17 years ago and the present. PS) You seem to confuse me with another person. I do not know her named RoSe. I am Korean. Thank you for translating my everything for me. 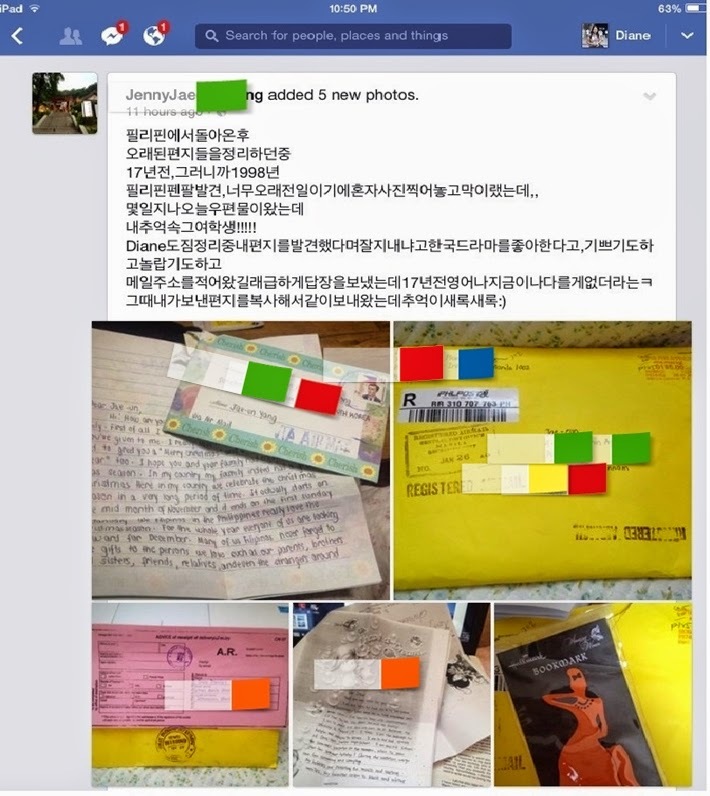 Actually the Facebook post of Jae-eun has comments, all written in Hangeul. I was the only person who wrote something in English. I have mistaken you as Rose's friend because I remember Rose telling me that she has a friend who can read and translate from Hangeul to English. Hence, I immediately concluded the connection. Thanks again for translating everything for me. I really appreciate it. Wishing you a great day ahead! Sorry for the confusion. I have thought that I have to refrain from leaving anonymous comments. The fault lies somewhat with me. I sincerely appreciate your hospitality.